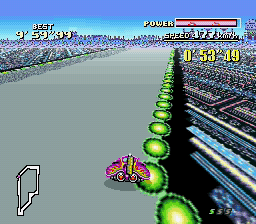 SNES F-Zero (USA v1.0) "first track" in 02:22.03 by Saturn. The first of the series. F-Zero is a racing game of the future, with machines that reach more than 470 km/h top-speed. This movie uses the Fire Stingray to surpass the world record time and best lap time on Mute City 1, the first stage.